Having received replacements 2504v ICs and 7400s, I got the video section apparently working as per the bring up guide. I then completed the computer section. On powering up, everything seemed OK. 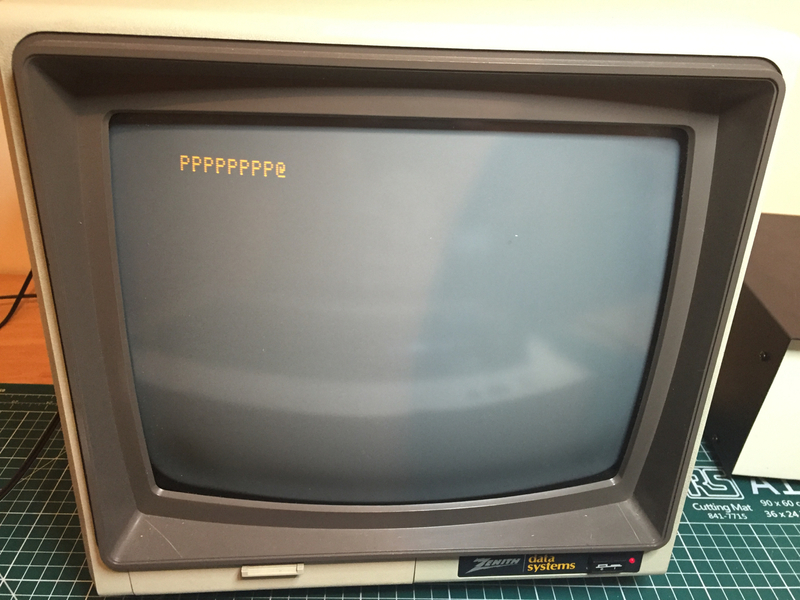 I got the usual flashing @'s and the CLR function (pin 12 to pin 16 on the KBD connector) cleared the screen as expected. Also the RST function (pin 1 to pin 9) worked as described. I then disconnected the keyboard adaptor and restarted. This time shoring pin 1 to pin 9 just produced P's again. I then had another go with the keyboard adaptor. Now, the keyboard was completely dead and the microcontroller was scalding hot. I have now disconnected and abandoned that. Working without a keyboard, RST still produces P's. I have swapped the 6502 and 6821 chips (for known working chips) as obvious culprits for a failed RST function but the result remains the same. For what it is worth, I have meticulously checked the wiring patches on the keyboard adaptor and they are all correct with no shorts. I would welcome advice. I fear somewhere along the line I have damaged some previously working components. The worry is what kind of damage has been done to the Mimeo-1 from the adapter trying to draw that much power. I wonder if you're getting P's because of the floating input to the PIA. Mike W's bringup guide talks about grounding the PIA input in the absence of a keyboard in order to eliminate random characters being entered. True, what you've described isn't really random characters as I imagine it, but it might be worth a try to eliminate it as a potential cause. It's described on page 19 of Mike W's bringup guide - at the end of "Section 3 - Power Up". Sounds like a definite short of some kind on the PS2 keyboard adapter. I'd say check it again in the morning, because when you're stressed you don't see things as clearly, and in the morning you often see the problem right away. Make sure you're not plugging it into the Mimeo backwards. I have to check, and double, and triple check those orientations before I do anything because it's so easy to put in backwards. There also could be a short on the actual pcb of the ps2 keyboard adapter (not related to the jumper section). in the power regulation section. all chips that are related to that power rails before continueing to the next step. the rectifying diodes for correct operation. If one got damaged by the shortcut that circuit should become replaced first. correct position of the cables before firing up power again after attaching such a unit. OK. So I have come back to this with a clear head in the morning. First the good news: the 6502 and 6821 are fine. I have a Briel Replica 1 which I had built earlier in the year as a starter project and, usefully, I can swap those two parts into this board and everything works OK (including, importantly, reset). The Mimeo-1 was basically working before I used the PS/2 adaptor. Both CLR and RST functioned as described. I am pretty sure I didn't plug the keyboard cable in the wrong way around. I am certain I didn't do this on the first occasion, because the PS/2 adaptor partially worked. Typing CTRL-C-L-R cleared the screen. Typing CTRL-R-S-T (or CTRL-ALT-DEL) didn't work in that it didn't reset the Mimeo-1. (I cannot now recall whether I got the P's then). Something that previously worked on the Mimeo-1 is now damaged, because I can no longer get it to reset. The most obvious culprit for damage by a defective keyboard input is the 6821 as this is tied directly to the keyboard connector. As explained above, however, this is not damaged. The keyboard connector is also tied to the CLR line on the video section. This still functions OK. The keyboard connector is also connected to the power rails. These seem to be fine reading +4.88v, +11.96v and -12.18v (at the keyboard connector) respectively (I assume those readings are within tolerance). The other components which are tied to the keyboard connector (and, as it happens, the RST line) are the 6502 (confirmed OK as above) and R24 (unlikely to be the culprit, but checked OK in any event). I doubt the P's are due to the floating input to the 6821. They only occur when I try to reset the computer and, in any event, that alone would not explain why the computer does not reset. I had already done some checking before I got speedyG's latest post, but the power supply section seems to be working fine. I have, in any event, followed his advice and the readings I get off the various smoothing capacitors are +4.92v, -5.03v, +11.97v and -12.17v respectively. As for the keyboard adaptor, I have been over this repeatedly with my multimeter and I cannot find any shorts or wrong connections. I had initially found what appear to be a short between +5v and GND, but this I later found was internal to the microcontroller (which now has a continuity between the VCC and GND pins – pretty safe to say that this is dead now). So the position seems to be that I clearly have a dead microcontroller. This may be because it was already faulty in someway or because it was damaged by wrongly connecting the keyboard connector. More significantly, there is now a fault with the Mimeo-1 which prevents it reseting (and which is not due to a faulty 6502 or 6821). I remain at a complete loss to diagnose this. As explained above, the PROMs are running fairly warm. I assume defective PROMs could cause the above symptoms. RST is a function of the 6502, but the outcome (a new line and a prompt symbol) is a function of the monitor program. If the PROMs were damaged, I assume that a reset could result in a bizarre outcome, such as the displaying of P's. Send me the PS/2 adapter and I'll probably be able to figure out what went wrong - After I diagnose it, I'll fix it and send it back in working condition. Since video is working, I'd think all that page of the schematic is working fine. If you have an O'scope or logic probe you can check if reset getting to the 6502 and then if the 6502 asserting chip select on the PROMs. Thanks for the offer of help. I have sent you an email. Sorry to hear about your latest obstacle. In regards to your question about the PROMS, warm is OK, too hot to touch is not OK.
Only the 5 volt regulator gets scalding hot. only two items remain to test: Reset and Clear lines. 1) Check the reset input (1) at the keyboard adapter. Short it ground, pins 40 (6502) and pins 34 (6821) should both be at 0 volts. 2) Check the clear input (12) at the keyboard adapter. It should be 0 volts. If not, you need to check all the chips connected to this pin. Does bringing it to 5 volts do anything ? 3) Keep the clear line (12) grounded at 0 volts, apply a momentary reset on pin (1). Does this solve the problem ? When you say keyboard 'adapter', I assume you mean the keyboard connector on the Mimeo-1. The PS/2 keyboard adapter is clearly damaged and is not safe to be connected to the Mimeo-1. Mike has very kindly agreed to have a look at it. Assuming the above, everything checks out. Both pin 40 of the 6502 and pin 34 of the 6821 are at +5V (+4.89V to be precise). Shorting pin 1 of the keyboard connector to ground brings both pin 40 of the 6502 and pin 34 of the 6821 to 0V (0.3V to be precise). Likewise, pin 12 of the keyboard connector is at 0V (0.3V to be precise). Grounding pin 12 results in the screen correctly clearing to a single flashing '@' character. I am more convinced than ever that the PROMs are damaged. I am getting a temperature of 55 degrees celsius (132 fahrenheit) off of A2. Furthermore, (and this is truly bizarre), if I wave my hand over the PROMs (not touching them at all, I only need to be within about 2 inches of them) I get a series of '[' characters on the screen. I should have a set of replacement PROMs by the end of the week. My test suggestions were at the keyboard socket with no keyboard or PS1 adapter plugged in. To see if the PROMS are dead, I would put a logic probe on the chip select (pin 13) of either PROM. If the PROM(s) are defective, the 6502 will attempt to run the monitor program and then hang up. On a logic probe LED this would appear as a momentary burst of flashes on the chip select line, followed by a constant red. If the PROMS are OK, the logic probe LED would flash continuously indicate the monitor is in a loop waiting for a keyboard stroke. The PROMs (especially A2) get very hot. Touching the plastic package (not the pins) of A2 causes multiple characters to be displayed on the screen. The multiple characters also appear even if I put my hand near A2 (without actually touching it). I have sourced some replacement PROMs and someone with a vintage programmer kindly programmed them for me. (They require programming voltages higher than my modern USB programmer can provide.) These appeared to work for a second or two and then displayed the symptoms referred to above. It therefore seems likely that there is a substantive fault in the Mimeo-1 which is killing the PROMs. I traced one of those signals back to pin 7 on the 74S125 at B8. In simple terms, the output from pin 7 is (sort of) derived from the inputs of pins 5 and 6. 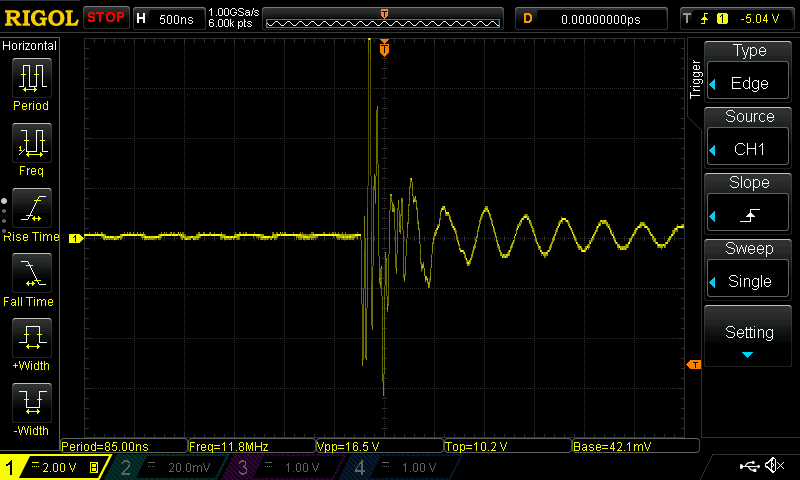 The yellow trace is the signal at pin 5 which is a nice clear TTL logic signal. (A similarly clear signal is seen on pin 6). The blue trace is, to my hugely inexperienced eyes, not what one would expect of TTL logic - it just appears to be a mess. Is it a reasonable assumption that there is a problem with the 74S125? Any comments or advice would be greatly appreciated. Is there really a 74S125 at the location of B8 ??? In fact there should be a 74157 or a 74S257 and NOT a 74S125 ! should be connected to the + 5 Volt rail. a voltage appears that is larger than the supply voltage of + 5 Volt ! And at the PIN 5 of the 74S257 at B8 there should be the signal "H5"
from PIN 13 of the 74161 at position D7 present. Compare both pins ! Sorry. It was a typo. I am talking about the 74S257 at B8. As far as the PROMs are concerned, yes there is 0V at pin 8 and +5v at pin 16. In terms of the other pins, there is a lot of noise and spikes and some of the spikes (especially at pin 15) can exceed +6v. Finally, pin 5 of the 74S257 at B8 shows the same signal as pin 13 on the 74161 at position D7 present. under normal conditions you should not see that 6 Volt! more than 5 Volt present ! Possible sources of that trouble might be the 8T97 chips at position A9 and A10. I am not sure I understand the relevance of the 8T97. From what I understand from the datasheet for the PROMs, the two chip enable lines are at pins 13 and 14. Pin 15 is an address line (A7) which comes from pin 7 of the 74S257 at B8. In any event, I have continued to explore the board with my scope. 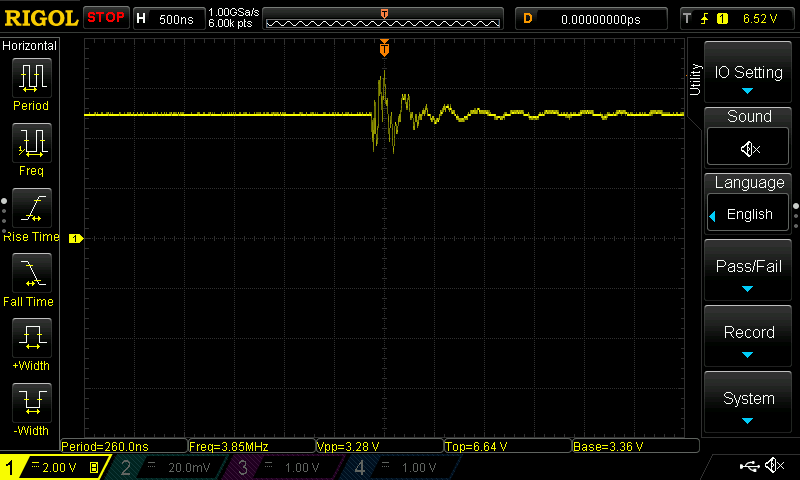 Again, I don't know whether this is relevant, but at power on and at power off, there are momentary voltage spikes. The trace below is from pin 15 of PROM A2 and, as you can see, has a peak to peak voltage of in excess of 12V (from -5.36v to +6.88v). I don't know whether that kind of spike can damage the PROMs. 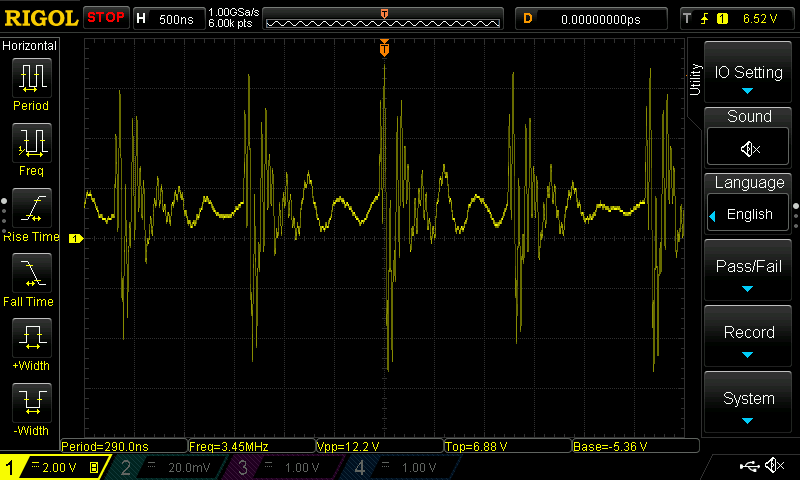 Spikes are seen at the output of the +5V regulated supply (i.e. across the 22uF cap at D15). But these are nothing like as marked. I don't know whether these are significant or likely to be the cause of the failure of the PROMs. OK. I don't know whether the maxim 'a little bit of knowledge is a dangerous thing' applies here and I am just posting irrelevant nonsense which just seems relevant from my ill-informed perspective. However, the trace below is taken from pin 8 of PROM A1 (which should be at GND). My 'scope probe is grounded to the -ve side of the capacitor at D15 (which is the true GND reference point for the +5V power supply). In theory, there should never be a voltage difference between these two points. However, as can be seen, there is (what appears to me to be) a significant voltage spike as the Mimeo-1 powers on. I have no idea what is causing this or whether this could be the cause of my problems. OK. I fear I may have made an embarrassing error in the way I was using my 'scope. So probably best to ignore what I have been posting the last couple of days. After over a month of attempting to debug my Mimeo-1, I have finally found the cause of the problem and got it working. I have already posted some fairly naive and rather embarrassing questions and comments on this forum. If I have any shred of credibility left, it will be gone if I disclose the cause of the problem. Suffice to say, it gives an entirely new meaning to the term 'floating' input. Don't worry about it -- we're all here to learn. Mistakes are part of the process. because you didn´t solve the problem correct after second occassion!" " don´t fear to stuggle and fall down .... in most cases you fall ahead forwards...!" I have thought very carefully about this, and it seems to me that what must have happened is that a thief broke into our house a few weeks ago and using a highly sophisticated desoldering tool, stole the solder from pin 21 of the 6820 socket. seems that guy was also in Europe ? between writing and then testing and debugging. Great to hear that you found the problem and got it fixed! I agree with what everyone's said on this thread. In my travels, the one rule I always see time and time again, is the people who are really good at anything, never shy away from revealing a silly mistake. The ones that are faking, they always hide from their mistakes. And when you think about it, it's not so odd - how do you think the ones that are really good ever got that good? Not by ignoring or hiding from mistakes. And as speedy said, if you think about the sheer number of solder joints in this thing, it's amazing it doesn't happen even more! My most embarrassing moments of silliness have probably helped me more than all my successes. Again, congratulations on fixing your problem! It's Murphy's law. No one is perfect and with so many solder joints it's easy to miss one. I've gotten in the habit of soldering joints on PCBs twice. Once I get a nice joint I touch it again on the opposite side to get everything flowing. This is because I had a cold solder joint once that drove me batty. It also gives me the opportunity to double check I got all the pins soldered. My worst troubleshooting was a solder whisker on my first mimeo. Mike helped me track it down. It was shorting out a logic line on a chip. After that one I got in the habit of blowing off and wiping down my workspace before I work on PCBs just incase I was doing something stupid like polishing a piece of metal with 000 steel wool over it. That is what I suspect left a small whisker of metal on my workbench. We all make mistakes, no matter how experienced. If we didn't there would never be post-it notes. Google it if you don't know the story. One thing I'm a big fan of is soldering under magnification. I use a Donegan magnified headset with a 6-led lighted attachment. The beauty of this setup is it is binocular, so you have depth perception, and it's lighted from multiple light sources, and it's comfortable. When I solder, I watch the solder flow onto each joint, and can verify each joint as I do it. I've had great luck with it, and I would say it's one of my most important soldering tools. I do solder under magnification and do watch the solder flow into each joint. This was just a mental block. In fact, it is quite unlike me as I am fairly OCD. It's just one of those things that happens from time-to-time. I also wear "cheater" glasses. I tried the scope thing at my Hackerspace, but find simple magnification glasses are just as helpful to me. Wouldn't say I agree with the term "cheater" glasses. I think of cheating as anything that fundamentally changes the nature of what you're doing to excessive proportions. This allows you to see what you're doing better, but you've still got to wield the soldering iron manually. Just my opinion. Now that I'm grey and old, "reading" glasses being called "cheaters" is a common slang expression. When I was young, I called them reading glasses. Never heard that term before. Interesting! Sorry - didn't mean to hijack the thread.